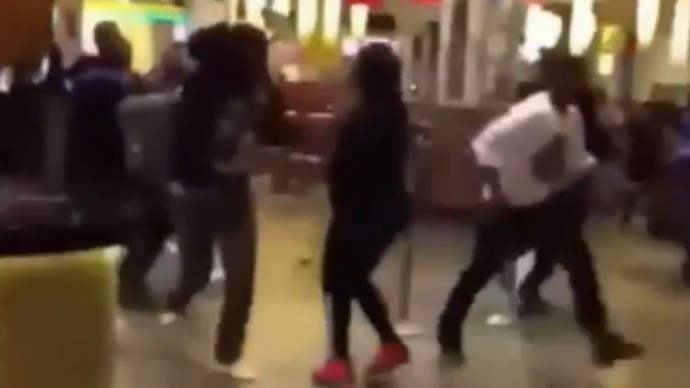 Three people have been arrested for disorderly conduct and resisting arrest after several dozen people engaged in a massive fight inside a casino in Queens, New York. An argument between two groups of people who were out gaming for the night turned into a full-scale Hollywood-style bar brawl with chairs being hurled across the room and people striking each other at random. The brawl erupted at about 10 pm at the Ozone Park Casino next to the Aqueduct Racetrack, police said. “It looks like 15-20 people were actually fighting amongst 300-400 patrons who were terrified and trying to get out of way. It looked way worse than it was,” a police source told the Daily News. Police said they thought total damage was about $2,000 but a casino source said that damage was minimal. Police gave the names of the two men arrested as Andre Rivers 23, from Brooklyn and Jovan Bovell 23 of Queens. Another man whose name was not given was also summoned for disorderly conduct. A spokesman for the Resorts World Casino, which owns the casino where the brawl broke out said the safety of their guests is their top priority. “We are reviewing all aspects of this unfortunate event and are fully committed to taking steps to ensure similar acts do not take place ever again,” a statement from the group said. Ozone Park Casino opened in 2011 and suffered its first major incident just six months after it opened when a thief walked away with $63,000 in cash.